Dagli archivi storici della FMP ricompare in forma restaurata conforme all'originale il box For Example, uscito nel 1978 con un ricco volume di immagini e documenti relativi ai primi dieci anni di attività dell'etichetta e tre album tratti dai numerosi Workshop Freie Musik tenuti all'Akademie Der Künste a Berlino a partire dal 1969. Della riedizione in vinile, in tiratura limitata a duecento copie, si occupa Be! Jazz, mentre una versione in digitale è sempre disponibile attraverso Destination:Out. Here is a fantastic three-disc sampling of FMP bands from the label's birth through 1978. It chronicles both the evolution of FMP itself, and the flowering of European free improvisation during that same period. The three LPs are grouped by format: the first features solo performances; the second, small groups; the third, large orchestral works. 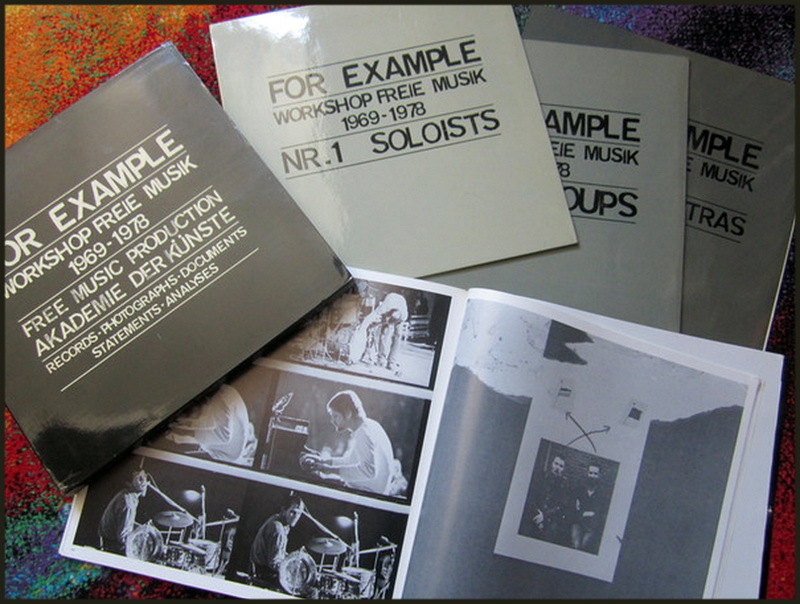 The 138-page book hosts written contributions from Steve Lacy, Misha Mengelberg, and Peter Brötzmann, as well as longer analyses by Ekkehard Jost, Wolfgang Burde, and Tomas Schmit. Gloriously illustrated throughout with black-and-white photos and archival posters used to announce the annual Workshop Freie Musik, it is a remarkable record of an explosion of talent and creative fire.